Cardboard wardrobe boxes, can be worth their weight in gold. These wardrobe boxes have hand holds ideally located for ease of carrying, so even when they are full they don't seem as heavy. They keep your clothes away from dust and grime and you wont drop them in the mud, like one customer once did when he tried to carry several of his suits from his car and they all slid out of his hands, one box could save you a fortune. 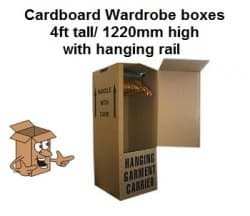 These are strong and tall corrugated wardrobe boxes, used widely by the removals and storage industry for moving and storing suits, dresses, long coats even costumes, military uniforms and religious gowns and any other items of clothing kept on clothes hangers. These wardrobe boxes are easy to carry, they reduce creasing, cover your suits and dresses from rain, dust or general moving grime and they also have space at the bottom to put your shoes, belts and ties into.